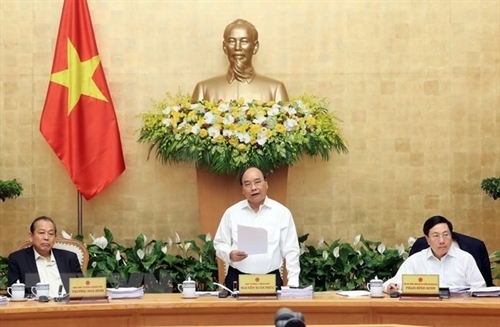 During the Government’s regular meeting in Hanoi on April 2, the PM said the socio-economic situation continued to improve in the first quarter this year, with gross domestic product growth of 7.38 percent, the highest in a decade. The agro-forestry-fisheries sector expanded by 4.05 percent, double that of the same period last year while agriculture and industry-construction grew 2.08 percent and 9.77 percent, respectively. Manufacturing and processing rose nearly 14 percent, services went up 6.7 percent and wholesale - retail hiked 4.5 percent. At the same time, Vietnam signed the Comprehensive and Progressive Agreement for Trans-Pacific Partnership with 12 states, held a national conference on disaster prevention and control, the sixth Greater Mekong Sub-Region Summit and the 10th Cambodia - Laos - Vietnam Development summit, particularly the GMS Business Summit, during which participants welcomed Vietnam’s initiatives, helping raise the country’s prestige in the international arena. During the period, total retail and consumption services increased by 9.9 percent year-on-year. Foreign tourist arrivals in Vietnam were estimated at 4.2 million, up 30.9 percent annually. Total exports surged 22 percent to USD 54.3 billion while social investment soared 10.4 percent. The PM revealed that Nikkei said in its new release on the same day, the Nikkei Vietnam Manufacturing Purchasing Managers’ Index was 51.6 points, making it one of two countries with more than 50 points. The business climate continued improving with the provincial competitiveness index reaching highest point since 2005. Vietnam’s securities market performed well in both scale and capitalization with the VN-Index hitting a 10-year high of 1,170 points. Positive performance was also seen in labor, job, social welfare, culture-education and health care while unemployment dropped by 2.2 percent. The number of newly-established enterprises only rose 1.2 percent annually while the number of firms that halted production remained high. The PM urged promoting corporate development, especially in creativity and innovation. Warning that though the consumer price index fell in March and rose slightly in the first quarter, inflation is still a risk, so ministries and agencies should take measures to stabilize macro-economy and control inflation. He called for attention to latent risks of complicated weather as Vietnam is one of the five countries hardest hit by climate change. As of late March, total State budget collection surpassed VND 308 trillion (USD 13.68 billion), up 5.3 percent annually. State expenses were estimated at VND 290 trillion, up 1.7 percent. Natural disasters caused losses of more than VND 178 billion, a 3.1-fold increase annually. As of March 15, there were 1,085 fires nationwide that killed 33 and injured 66, causing damage of more than VND 413 billion.